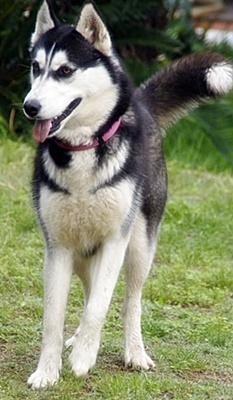 From time to time, we take in Siberian Huskies in need of a new home. The reasons why dogs are surrendered to us are varied, but each case sees a needy dog looking for a new home. Why do we do it - time after time? When people say, "I couldn't foster because it would be too hard to give a dog up"; we say, "How can it be harder than knowing a dog died because no foster home took it in when needed?" CLICK HERE to see pictures of some of these dogs in their new homes. Settled in and happy in a secure future. The Siberian Husky is a northern breed sled dog, which means they have lots of fur and lots of energy and the desire to run fast and far. They don't like to be left alone, so they do best in an active household with a secure fence, no cats, and at least one other dog. They are fun, smart, funny and paired with the right trainer and technique, trainable with many excelling in agility and obedience work as well as sled racing. These dogs must be permitted inside the house and taken on family activities and outings. Bella - born 18 December 2013, she had a number of homes around Sydney before falling pregnant and delivering 5 pups in December 2018. Once the pups were weaned, we were asked to foster and re-home her as Bella's owner suffered a hand injury and could not manage a Husky without difficulty. We took in a way too thin Siberian Husky, who, after a bath and a brush out, showed a real spark of optimism and determination. This dog has the potential to become a happy, healthy and affectionate pet who will stick by you for many years of companionship. She's a bright and happy mature adult, who is only looking for a calm environment to settle into quietly and make sense of her changed life. Bella needs a secure yard with high fences and a gate that cannot easily be opened. Bella is only available to a home where she is permitted to spend time in the house with her people. She's calm and settled indoors, and is toilet trained, provided that you take her outside to toilet every 2 - 3 hours. 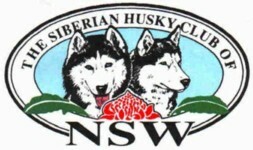 Only available to a home experienced in living with a Husky, or other large Arctic breed, and a commitment to daily exercise and weekly dog obedience training classes. She's available for a donation of $300 which covers Vet fees to make sure she is desexed, vaccinated and wormed. Please contact Richard and Mara to arrange a meeting with the possibility of taking Bella home with you, initially on trial. Bella goes on a 4 week trial, to be returned if she does not suit. Born 1 January 2016, Chelsea is a black and white desexed purebred Siberian Husky. Warm brown eyes, an athletic build, and a great running attitude. 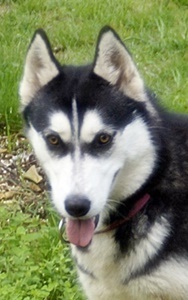 She is good natured, non protective and gets on well with our other Huskies. This dog is ready to run in the Winter 2019 race season. She is fit, muscular and has a great work ethic. These attributes make her unsuitable as a pet in an urban situation, however and as there are other "couch potato" Huskies around, Chelsea won't go to a sedentary or too busy household. Though she was surrendered because she was too boisterous for the family with a toddler and another baby on the way, Chelsea is well behaved around confident children. [Of course, Chelsea should never be left with a child unless supervised.] She had been given to them as a part grown pup, and without doing enough research on this breed, they took her in. Then realised that a Husky was too high maintenance for them to cope with. We are seeking a home for Chelsea with a strong commitment to and experience with sledding or racing. Chelsea lives well and quietly in a kennel block situation, and needs daily running as she is fit and has a strong work ethic and an innate need to run. If you have 1 or 2 Huskies who race, or are interested in starting to race with one Husky this Winter season, then Chelsea would be a real asset to your team. 4. time in the house with the family. A Husky left alone in the backyard becomes bored, and then destructive, or learns to escape. 5. no cats or "pocket pets" as she has a high prey drive and will chase and grab animals from a sheep down in size. 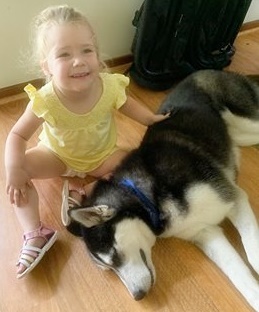 She is great with children, though knocks over the smaller ones, and Chelsea respects, listens to and loves adults. 6. a commitment to attending weekly dog obedience training classes. Chelsea has had little guidance or discipline through her life so far, and is learning manners, loose leash walking, and basic commands. This base needs to be reinforced and built on, and enrolling in a dog obedience training class is an ideal solution. 7. a secure and safe yard from which she cannot escape, as this breed will RUN if they get a chance - straight across roads if they get out of the yard. 1.8 metre high fences, preferably of colourbond, are essential and we will not deviate from this requirement. REWARD: Saving lives, one cuddle at a time! 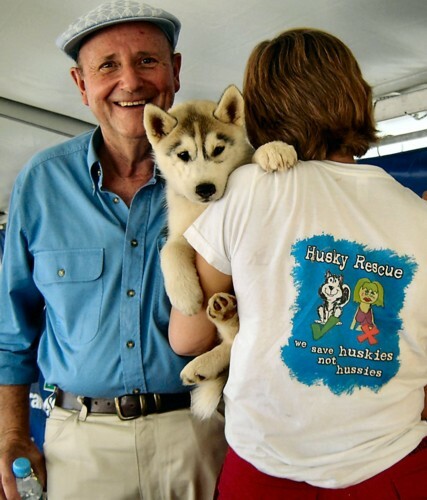 This Web Site is an Australia-wide listing of pure breeds of dogs from registered breeders. Includes puppies, mature dogs and rescues in need of homes as well as pages of information on every health and behaviour topic you could think off - worthwhile bookmarking to dip in when you need quick answers - and often has Siberian Huskies in need of homes. 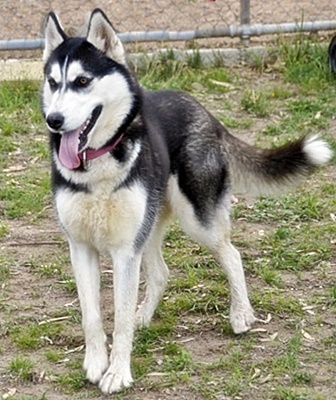 Petrescue lists Huskies in need of new homes. Sammy (was No Name), Hope, Miika, Chloe, Cameo and her sister Ezra (was Chatelaine), Marley (was Ruby), Shadow, Astra, Nimbus, Fletcher (was Feathers), Storm and Mia. In 2012 these dogs were fostered here - and found the best family homes: Sass, Mailen (was Bide), Shadow, Cleo, Utah, Cyba (who was also here in 2007) Bupp (now Dime), Khan, Sash, Benji, Harlow, Breeze, Mika, Sasha, Motzee (was Ramble), Missy and Jesse. In 2007 we found homes for these dogs fostered here with us: Oscar, Sasha, Delilah, Picard (now called Max), Gus, Diesel, Ricky, Cyba, Kobe, Hero, Lupo (now named Ringo), Hutch and Storm. We heard that Max, Blue Belle, Heidi, Snowbell, Chief, Anook, Zola, Meis-je, Flame, Ruby, Jordan, Quinn, Akirra, Sasha, Flake, Jabbalena, Ice, Kirby, Shesha, Flake (now called Max) and Chanel found new homes. In 2006 we placed Missy, Lakota, Tasha, Sebastian, Raven, Billy, Rusty, Velvet, Boris, Natasha, Narla, Ben, Wolfgang, Faith, Iggy, Faye, Ace of Spades and Loki - ALL OF WHOM had been fostered here with us for some time. We heard that Ivan, Esky, Nikita, Bear, Neko, Shadow, Sky, Max and Simba found new homes. In 2005 we placed Ben, Buddy, Frankie, Shamus, Enigma, Striker, Sierra, Rosie, Honey, Angel, Ghost, Chopak, Bear and Domino as well as Bundy, Candy and Roger (Alaskan Malamutes) and heard that Pearle, Georgie, Zarr, Mimi, Yargo, Misty, Koda, Iceman and Vader found good homes. In 2004 we placed Rex, Dakota, Ingus, Simba, Basil, Misty, Shadow and Moby! Also Ski whose home lasted around 12 months and who found herself back here and in need of a new family to love. Kusco, Kimba, Jolie, Panda, Snowy and Betty. In August we placed Keeta and Leo, found Tasha's owners (her name is Icey) and heard that Skyla, Pushkin and Odessa had new homes. In October Primrose found a loving family home, as did Ebony and Treasure. In 2002 we placed Phena, Otis, Troppo, Casper, Faith and Rhea, Tayla and Kira ALL OF WHOM had spent some time here being fostered.